CD25+CD4+ regulatory T cells participate in the regulation of immune responses. We recently demonstrated the presence of CD25brightCD4+ regulatory T cells with a capacity to control T cell proliferation in the joints of patients with rheumatoid arthritis. Here, we investigate a possible accumulation of these regulatory T cells in the inflamed joint of different rheumatic diseases including rheumatoid arthritis. The studies are also extended to analyze whether cytokine production can be suppressed by the regulatory T cells. Synovial fluid and peripheral blood samples were obtained during relapse from 36 patients with spondyloarthropathies, 21 adults with juvenile idiopathic arthritis and 135 patients with rheumatoid arthritis, and the frequency of CD25brightCD4+ T cells was determined. Of 192 patients, 182 demonstrated a higher frequency of CD25brightCD4+ T cells in synovial fluid than in peripheral blood. In comparison with healthy subjects, the patients had significantly fewer CD25brightCD4+ T cells in peripheral blood. For functional studies, synovial fluid cells from eight patients were sorted by flow cytometry, and the suppressive capacity of the CD25brightCD4+ T cells was determined in in vitro cocultures. The CD25brightCD4+ T cells suppressed the production of both type 1 and 2 cytokines including interleukin-17, as well as proliferation, independently of diagnosis. Thus, irrespective of the inflammatory joint disease investigated, CD25brightCD4+ T cells were reduced in peripheral blood and enriched in the joint, suggesting an active recruitment of regulatory T cells to the affected joint. Their capacity to suppress both proliferation and cytokine secretion might contribute to a dampening of local inflammatory processes. Relapses and intermittent remission phases characterize the disease course in rheumatic diseases and other chronic inflammatory conditions. This waxing and waning probably corresponds to a regulation of the disease, in which the immune system is believed to play a major role by balancing pro- and anti-inflammatory immune reactions. CD25+CD4+ regulatory T cells constitute one cell population involved in maintaining this homeostatic balance, because a lack of cells with this phenotype has been demonstrated to be associated with autoimmune disease in animals. Early experiments showed that neonatal thymectomy of mice led to the development of various organ-specific autoimmune manifestations, such as gastritis, oophoritis, orchitis and thyroiditis . Later, it was demonstrated that CD25 identified these regulatory CD4+ T cells , and despite extensive research, so far no other cell surface marker has been found to be generally applicable for these cells. The transcription factor Foxp3 has been shown to be specific for these cells [3–5]; however, its intracellular expression does not yet allow live sorting of cells for functional assays. In the peripheral immune system of naive mice and in any thymus, the expression of CTLA-4, GITR (glucocorticoid induced tumor necrosis factor [TNF] receptor) and CD62L are correlated with CD25+CD4+ regulatory T cells [6–8]. However, because the expression of these molecules is also altered after T cell activation, they are not informative markers of CD25+ regulatory T cells in antigen-experienced animals or humans [9–11]. We instead subgroup the CD25+ T cells according to the level of CD25 expression. This has been demonstrated to roughly divide activated (intermediate CD25 expression) from regulatory T cells (high CD25 expression) in the peripheral blood of healthy subjects . We have recently shown that patients with rheumatoid arthritis (RA) have an enrichment of CD25brightCD4+ T cells in their inflamed joints . Here, owing to the accumulation of activated cells in the target organ of the disease, the gate for inclusion of regulatory T cells is even more restricted than in peripheral blood (bright CD25 expression). Given the animal data in which cell transfer of regulatory T cells into animals can prevent the development of chronic inflammation, as reviewed in , one would expect humans with an autoimmune disease to have smaller numbers of regulatory T cells, but surprisingly, despite counting only CD4+ T cells with the highest level of CD25 expression, an enrichment of regulatory T cells was seen. Thus, the simple extrapolation of the animal data into future therapeutic strategies that aim at reconstituting this population does not seem to hold true in human organ-specific autoimmune diseases. Our results obtained from patients with RA  therefore raised several questions: Do these cells exist in inflamed joints of rheumatic patients irrespective of diagnosis? Are they accumulated at the site of inflammation? Can these regulatory T cells from synovial fluid suppress cytokine production, which is an important feature of the chronically inflamed joint? Also, with a large patient cohort can we address the question of possible correlations of frequency of regulatory T cells and clinical parameters such as disease duration, severity of disease, and treatment? To address these questions we decided to analyze adult patients with juvenile idiopathic arthritis (JIA) and patients with spondyloarthropathies, diseases in which peripheral joint inflammation occurs, and to compare them with results from patients with RA. Despite different clinical features of these disorders, the knee inflammation has similar characteristics: an infiltration of inflammatory cells; an increase in volume of synovial fluid; and a local production of proinflammatory cytokines. Interleukin-17 (IL-17) is a T cell-derived cytokine with similar proinflammatory properties to IL-1 and TNF in the inflamed joint . We recruited 192 patients with spondyloarthropathies, JIA or RA to study regulatory CD25brightCD4+ T cells in the inflamed joints. Our results clearly demonstrate an enrichment of CD25brightCD4+ regulatory T cells in the inflamed joints in comparison with peripheral blood. This cell population suppressed both cytokine production and proliferation of other T cells and can therefore be regarded as containing regulatory T cells. However, the frequency in the inflamed joint could not be associated with disease duration, disease severity or treatment. Thirty-six patients with spondyloarthropathies, 21 with JIA (as defined by the International League of Associations for Rheumatology criteria [16, 17]) and 135 with RA (as defined by the American College of Rheumatology criteria ) were recruited from the Rheumatology Clinic at the Karolinska Hospital, Stockholm, Sweden. Within the group of patients with spondyloarthropathies, 26 were diagnosed with psoriatic arthritis (PsA) and the other 10 were diagnosed with ankylosing spondylitis or undifferentiated spondyloarthropathies (SpA). The patients with JIA were all adults and had a polyarticular disease. Of the 135 patients with RA, 26 were seronegative for rheumatoid factor (RF). The synovial samples were obtained from the patients when excess fluid was removed from swollen joints before glucocorticoid was injected as part of the clinical routine procedure. Paired peripheral blood samples were obtained from 166 of these 192 patients. Peripheral blood samples were also obtained from 29 healthy donors. This study was performed after human subject approval from the Karolinska Hospital. Informed consent was obtained from all contributing individuals. Table 1 provides a summary of the patients and healthy controls included in the frequency study. JIA, juvenile idiopathic arthritis; na, not analyzed; PB, peripheral blood, SF, synovial fluid. aCalculated as percentage of CD25brightCD4+ cells in SF divided by percentage of CD25brightCD4+ cells in PB. bA significant enrichment of CD25brightCD4+ T cells in SF over that in PB was found: ***P < 0.0001. cAnkylosing spondylitis and undifferentiated spondyloarthropathies. Excluded are patients with reactive arthritis and gastrointestinal inflammation. Mononuclear cells were prepared from peripheral blood and synovial fluid by Ficoll separation (Ficoll-Paque; Pharmacia, Sweden). For frequency determinations cells were stained with anti-CD3-FITC (clone SK7), anti-CD4-PerCP (SK3) and anti-CD25-APC (2A3) (all from Becton Dickinson [BD], Franklin Lakes, NJ, USA). The stained cells were analyzed by flow cytometry on a FACSCalibur (BD). For functional studies, synovial fluid mononuclear cells (SFMC) expressing CD3 on their surface were sorted into CD25brightCD4+ T cells and CD25-CD4+ T cells, also referred to as responder cells (RSF). The sorting gate for CD25brightCD4+ T cells was adjusted to contain CD4+ T cells that expressed CD25 more brightly than activated CD25+CD8+ T cells. SFMC not expressing CD3 were sorted as antigen-presenting cells (APCs). The sorting was performed on a fluorescence-activated cell sorting (FACS) Vantage SE cell sorter (BD) or on a MoFlo cell sorter (Cytomation, Fort Collins, CO). After sorting, the purity of the sorted populations was determined by FACS reanalysis of an aliquot of cells, and was 90% on average (data not shown). Small dying and large activated T cells were excluded from the sorting gates. Coculture experiments were set up with 2 × 104 autologous APCs, 5 × 103 CD25- CD4+ RSF, and varying numbers of CD25brightCD4+ cells in plate-bound anti-CD3-coated wells (OKT-3; 1 μg/ml). The cell culture medium was based on RPMI with 100 units/ml penicillin-streptomycin, 2 mM glutamine, 10 mM HEPES buffer (all from Gibco BRL, Invitrogen Corporation) and 5% human pooled serum (Blood bank, Karolinska Hospital, Stockholm, Sweden). To detect cytokines, some experiments were set up with 20,000 responder T cells per well (indicated in Table 2). The sorted autologous CD3-depleted SFMC were irradiated (33 Gy) and used as APCs. Cells were incubated at 37°C for 6 days, the last 15–18 h in the presence of [3H]thymidine. Standard sandwich ELISAs and human Th1/Th2 cytokine cytometric bead array (CBA) were performed to determine the concentrations of interferon (IFN)-γ, TNF, IL-2, IL-17, IL-10, IL-13 and IL-4 in culture supernatants after 5 days of culture. The antibodies used for ELISA were bought from MABTECH AB (Sweden) (IFN-γ), Pharmingen (IL-10 and IL-13) and R&D (IL-17). The CBA kit was bought from BD. Production of cytokines and proliferation of responder cells in patients with psoriatic arthritis (PsA), spondyloarthopathies (SpA), juvenile idiopathic arthritis (JIA) and rheumatoid arthritis (RA) are shown. 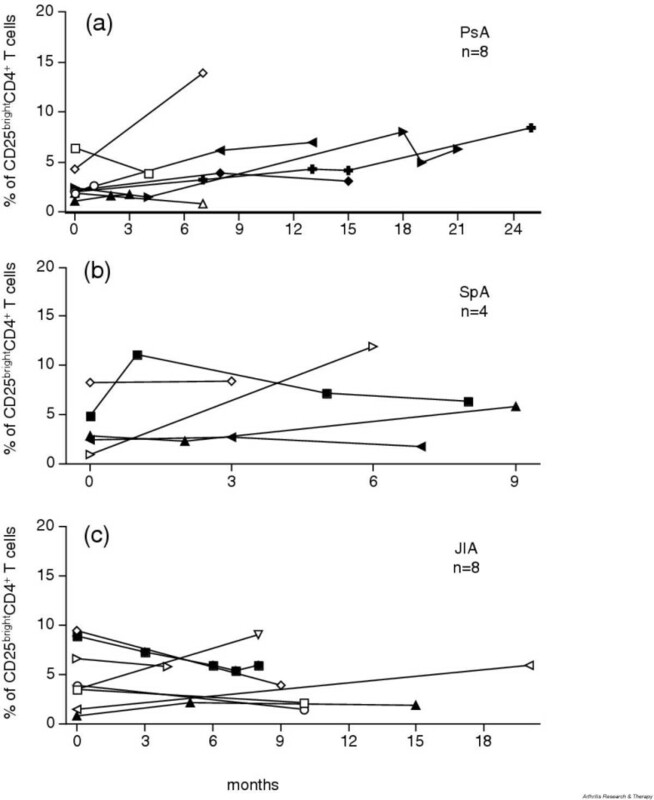 Changes in cytokine and proliferation levels after coculture with CD25brightCD4+ T cells are shown in Fig. 5. bdl, below detection limit; IFN, interferon; IL, interleukin; na, not analyzed; TNF, tumor necrosis factor. aEnzyme-linked immunosorbent assay; detection limit is 50 pg/ml; 20,000 cells per well in coculture. bCytometric bead array; detection limit is 3 pg/ml; 5000 cells per well in coculture. The frequencies of CD25-expressing cells from peripheral blood and synovial fluid were compared by the Mann–Whitney test. The Kruskal–Wallis test was used for comparison of the frequencies of synovial and peripheral blood CD25brightCD4+ cells between groups of patients with different diagnoses. Regression analyses were performed to analyze possible correlations between the frequency of CD25brightCD4+ cells and disease duration or levels of C-reactive protein (CRP) in the circulation. In total, 192 patients with different chronic rheumatic diseases were included in this study, in which synovial fluid and peripheral blood samples were screened for the frequency of CD25brightCD4+ T cells by flow cytometry. Information about the 26 patients with PsA, the 10 patients with SpA, the 21 patients with JIA and the 135 patients with RA are provided in Table 1. For comparison, peripheral blood samples from 29 healthy subjects were also analyzed. The flow cytometric analysis gates, for determining the frequency of CD25brightCD4+ T cells in peripheral blood and synovial fluid of patients, were set in accordance with our previous study on patients with RA, in which functional regulatory CD25+ T cells were isolated . The gate for CD25brightCD4+ T cells in synovial fluid was set higher than for peripheral blood, as shown in Fig. 1a. This is necessary because the joint fluid contains a larger proportion of highly activated T cells [19, 20]. CD25brightCD4+ T cells are enriched in the joint of patients with rheumatic diseases and are decreased in peripheral blood. (a) Representative fluorescence-activated cell sorting plots of paired peripheral blood (PB) mononuclear cells and synovial fluid (SF) mononuclear cells from one patient with psoriatic arthritis (PsA). Numbers within the gates represent the percentage of CD25brightCD4+ T cells of all CD4+ T cells. (b) Frequency of CD25brightCD4+ T cells in synovial fluid of patients with PsA, spondyloarthopathies (SpA), juvenile idiopathic arthritis (JIA) and rheumatoid arthritis (RA). Each triangle represents one individual. (c) The frequencies of CD25brightCD4+ T cells in peripheral blood were compared between healthy subjects and rheumatic patients. Significant differences between patient group and healthy subjects are indicated with asterisks: *** P < 0.0001; ** P = 0.001; * P = 0.02. Note that the scale is different from that in (b). (d) Relative increase of CD25brightCD4+ T cells in synovial fluid in comparison with that in peripheral blood (fold increase) analyzed in all patients from whom paired synovial fluid and peripheral blood samples had been obtained. na, not applicable. A frequency analysis of CD25brightCD4+ T cells in synovial fluid demonstrated high frequencies of these cells in all patient groups, with a median of 2.6% in PsA, 3.4% in SpA, 3.7% in JIA and 2.3% in RA (Fig. 1b and Table 1). A parallel analysis of peripheral blood samples showed a significantly lower frequency of these cells in the blood than in synovial fluid, with a median of 0.6% in PsA, 1.2% in SpA, 0.4% in JIA and 0.7% in RA (Fig. 1c and Table 1). To confirm this enrichment of CD25brightCD4+ T cells at the level of single individuals, the relative increase in synovial fluid over that in peripheral blood was calculated. In all 21 JIA patients, in 21 of 23 PsA patients, in 6 of 7 SpA patients and in 110 of 117 RA patients, increased frequencies were measured in the joint, indicated by a fold increase of more than 1 (Fig. 1d and Table 1). The median increase for patients with PsA was 4.7, for patients with SpA 5.0, for patients with JIA 6.4 and for patients with RA 3.7; P values are given in Table 1. The median level of expression of CD25brightCD4+ T cells in peripheral blood of healthy subjects was 1.2% (Fig. 1c and Table 1). A comparison of peripheral blood frequencies of CD25brightCD4+ T cells between patients and healthy subjects showed significantly lower levels in the rheumatic patients, indicating a selective recruitment of regulatory T cells in the inflamed joint. Only in the seven patients with SpA was the median frequency in peripheral blood equal to that of healthy controls. To investigate whether the enrichment of CD25brightCD4+ T cells is a general phenomenon of the inflamed joint, we compared the frequencies of synovial CD25brightCD4+ T cells between the different patient groups. No statistically significant differences were found (Fig. 1b). Thus, these data indicate that CD25brightCD4+ T cells accumulate in inflamed synovial joints of patients with chronic rheumatic diseases irrespective of diagnosis. Several of the rheumatic patients had recurrent effusions in their knee joints, from which synovial fluid was obtained. This allowed a longitudinal study of the frequencies of CD25brightCD4+ T cells in eight patients with PsA, four with SpA and eight with JIA (Fig. 2). In nine of these patients, three or more samples were obtained from the same joint. Although we had some variations, the frequencies did not differ significantly over time. CD25brightCD4+ T cell population persists over time. (a) Eight patients with psoriatic arthritis (PsA), (b) four patients with spondyloarthopathies (SpA) and (c) eight patients with juvenile idiopathic arthritis (JIA) were followed longitudinally, and the frequency of synovial CD25brightCD4+ T cells was measured at each relapse from which synovial fluid was obtained. Open symbols depict patients who had two relapses during the study period; filled symbols depict patients who had three or more relapses. Time point zero corresponds to the first time point at which synovial fluid was analyzed for the frequency of CD25brightCD4+ T cells. From one patient with PsA and one with SpA, samples from both knees were obtained; arrows pointing left, left knee; arrows pointing right, right knee. Clinical data were collected from 100% of our SpA and RA patients, and from 60% of PsA and JIA patients, to determine whether the frequencies of CD25brightCD4+ T cells in the synovial fluid and peripheral blood could be correlated with disease duration, severity of disease and degree of inflammation. Because of the large number of patients required for statistically reliable analyses when subdividing patients, we here present the results of the investigations on only the RA patients in graphic format. The other patient groups were, however, also studied and the results are presented at the end of this section. The first question we addressed was whether the accumulation of CD25brightCD4+ T cells in the inflamed joints is dependent on the chronicity of the disease. We thus investigated whether disease duration was correlated with the frequency of CD25brightCD4+ T cells. As shown in Fig. 3a, the number of years with disease had no impact on the frequencies of regulatory T cells, either in synovial fluid or peripheral blood. The frequency of CD25brightCD4+ T cells of patients with rheumatoid arthritis is not associated with clinical parameters. 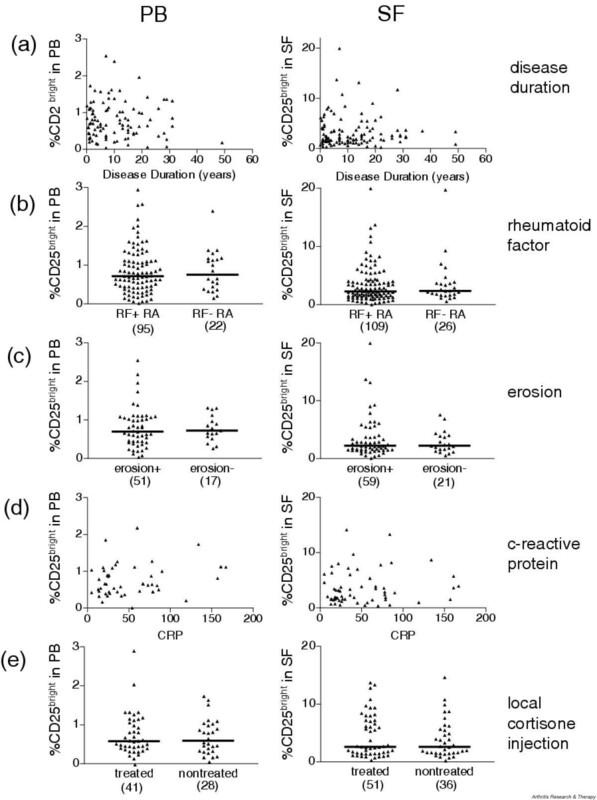 Peripheral blood (PB, left column) and synovial fluid (SF, right column) were analyzed for the correlation with (a) disease duration, (b) the presence or absence of rheumatoid factor (RF), (c) the presence or absence of erosions, (d) the level of C-reactive protein and (e) intra-articular cortisone treatment. In (a), (b) and (c) each symbol represents one patient; that is, mean values of CD25brightCD4+ T cells from the different visits. In (d) and (e) each symbol represents a single visit; the number of symbols in each diagram is presented in brackets. Second, to study whether the severity of disease could be correlated with a decreased frequency of regulatory T cells, we chose to study the presence or absence of RF and erosions. RF is a predicting factor for the development of a more severe disease course with the erosion of cartilage and bone . The presence of erosions is clinically analyzed in the small joints of hands or feet, which are the joints first affected in RA. Thus, the X-ray analysis clearly answers the questions of whether the disease has progressed to an erosive, more severe disease. We categorized the RA patients with regard to the presence or absence of RF in serum (Fig. 3b) and with regard to the presence or absence of erosions (Fig. 3c), and compared the frequencies of CD25brightCD4+ T cells in both synovial fluid and peripheral blood. The range of CD25brightCD4+ T cells in the inflamed joint in the patient groups with or without RF was comparable, with medians of 2.3% in the RF-positive group and 2.4% in the RF-negative group (Fig. 3b), as it was in peripheral blood, with a median of 0.7% in the RF-positive group and 0.8% in the RF-negative group (Fig. 3b). When comparing the patients with and without confirmed erosions, no significant differences were found between the groups (Fig. 3c). The range of CD25brightCD4+ T cells in the inflamed joint in the patient groups with or without erosions was the same, with a median of 2.2% in both groups, as was the range in peripheral blood with a median of 0.7% (Fig. 3c). This clearly demonstrates that within this patient material there are no correlations between severity of disease and frequency of regulatory T cells. Third, to correlate the degree of inflammation in the patients, CRP levels were compared with frequencies of CD25brightCD4+ T cells in both synovial fluid and peripheral blood. The level of CRP was measured on the day of visit or within 1 week before synovial fluid sampling. No correlation with the size of regulatory T cell population was observed (Fig. 3d). Last, we took into account the local, intra-articular, treatments that the patients were receiving. Only those patients with documentation of intra-articular cortisone injection within 3 months before sampling are depicted in Fig. 3e. As can be seen, no difference could be detected in the frequency of CD25brightCD4+ T cells irrespective of whether the patients had received corticosteroids during their previous bout. The range of CD25brightCD4+ T cells in the inflamed joint in the patients treated or not treated was the same, with a median of 2.6% in both groups (Fig. 3e), as was the range in peripheral blood, with a median of 0.6% (Fig. 3e). As mentioned above, we also investigated the SpA, PsA and JIA patients with regard to the stated clinical parameters. None of the parameters showed any correlation with the size of the CD25brightCD4+ T cell population, nor were there any tendencies in the limited pool of patients with these diagnoses. To investigate whether synovial CD25brightCD4+ T cells from patients with PsA, SpA or JIA contain a suppressive population, two patients from each group were selected for functional studies. Because the cytokine suppression profile of patients with RA has not been analyzed previously, we also included two patients from this group for these functional studies. Patient characteristics for these eight patients are presented in Fig. 4. The selection of patients was based on both the frequency of CD25brightCD4+ T cells and the availability of large numbers of synovial cells. CD25brightCD4+ T cells and CD25-CD4+ T cells from synovial fluid were sorted according to the sorting gates shown in Fig. 4. The FACS plots are gated via CD3+ cells and the sorting gate for CD25brightCD4+ T cells includes all cells with a brighter CD25 expression than the CD25+CD8+ T cells. The experiments were set up with variable number of CD25brightCD4+ T cells added to a constant number of autologous CD25-CD4+ RSF. As expected from regulatory T cells, CD25brightCD4+ T cells alone did not proliferate in response to the anti-CD3 stimulation in any of the patients analyzed, depicted in the figure as CD25br (Fig. 5). The amount of proliferation of responder cells alone is shown in Table 2. In all eight patients, the CD25brightCD4+ T cell population was able to suppress the proliferation of responder cells in a dose-dependent manner (Fig. 5), with suppression greater than 50% at a ratio of 3:1 of CD25brightCD4+ T cells to responder T cells. At lower ratios the efficiency of suppression showed high variability between patients (Fig. 5); this was also seen in our previous study on RA patients . Sorting gates and disease characteristics for patients included in the functional studies. Each row represents one patient. The sorting gates for isolation of CD25bright (25bright) and CD25- (R) T cells are indicated in the fluorescence-activated cell sorting plots, which are gated on CD3+ cells. Under treatment only so-called disease-modifying anti-rheumatic drugs (DMARDs) are presented. All patients also received non-steroidal anti-inflammatory drugs. CD25brightCD4+ T cells suppressed both proliferation and cytokine secretion of synovial responder cells. 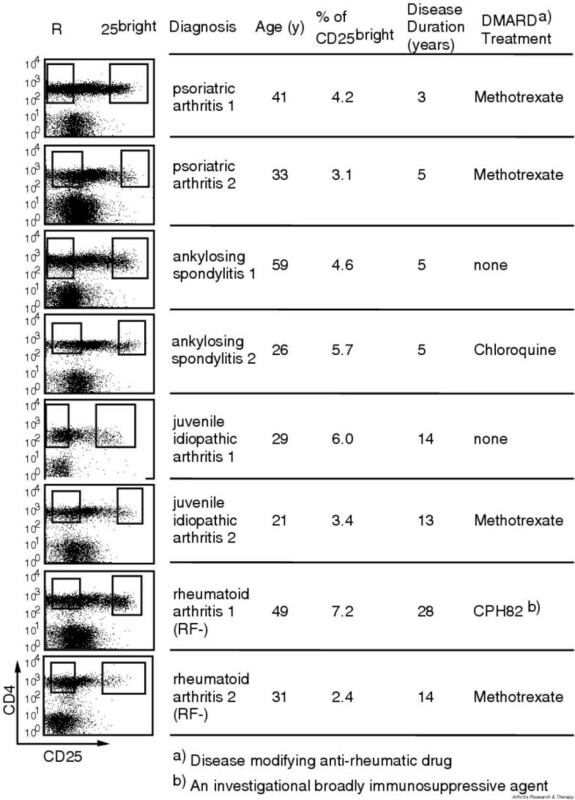 CD25brightCD4+ T cells and CD25- CD4+ T cells (RSF) from two patients with psoriatic arthritis (PsA), two with spondyloarthopathies (SpA), two with juvenile idiopathic arthritis (JIA), and two with rheumatoid arthritis (RA) were sorted by flow cytometry. Increasing numbers of CD25brightCD4+ T cells were added to a fixed number of autologous RSF in coculture. Proliferation was measured after 6 days of culture with anti-CD3 stimulation (filled symbols). Culture supernatants were analyzed for cytokine content (open symbols). A response of 100% equals a proliferation/cytokine secretion of CD4+ RSF on their own. IFN, interferon; IL, interleukin; TNF, tumor necrosis factor. The coculture supernatants were screened by ELISA or CBA for the concentration of the T cell-produced cytokines IFN-γ, IL-2, TNF, IL-17, IL-10, IL-13 and IL-4. In all patients, IFN-γ was the major cytokine produced by the responder T cells (Table 2). As expected, CD25brightCD4+ T cells on their own did not produce any of the cytokines investigated (Fig. 5). However, these cells were able to significantly suppress the IFN-γ production by responder T cells in all patients (Fig. 5). In addition, they suppressed the production of TNF, IL-10 and IL-13 whenever the responder T cells produced detectable amounts of these cytokines (Fig. 5). Neither IL-2 nor IL-4 was detected under these culture conditions. 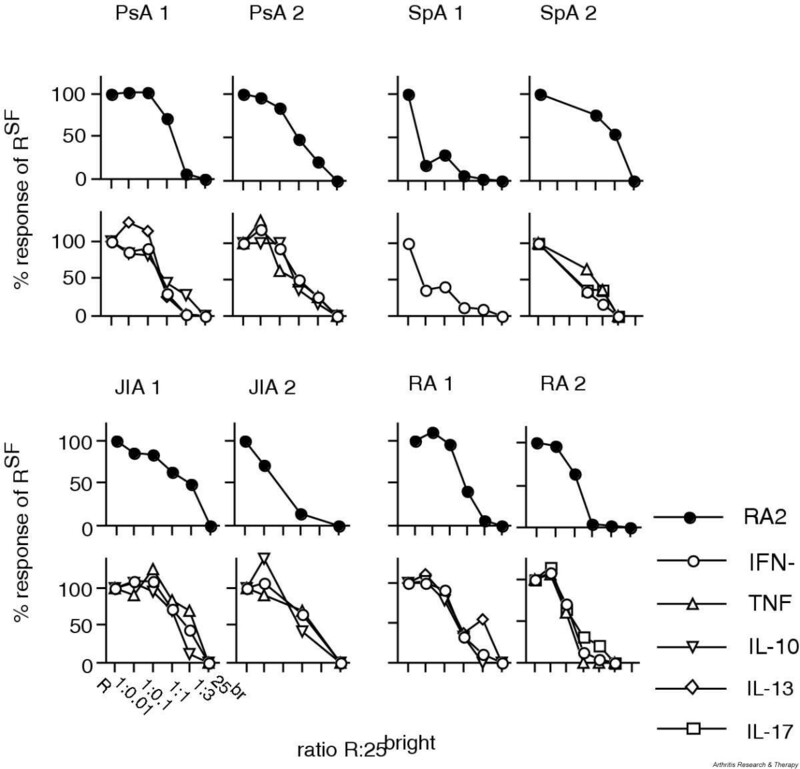 IL-17 was analyzed in one patient with SpA and one with RA. Production of this cytokine was also inhibited by the CD25brightCD4+ T cells. Table 2 shows the concentration of cytokines produced by the responder cells alone. The amount of IL-17 produced by the responder cells was 674 and 78 pg/ml, respectively. In summary, CD25brightCD4+ T cells isolated from synovial fluid, irrespective of diagnosis, contain regulatory T cells with a capacity to suppress T cell-driven immune responses. 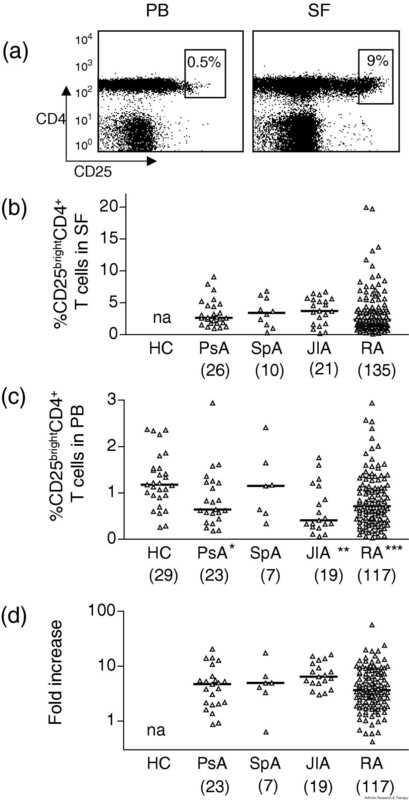 This study demonstrates that the fluid from inflamed joints of patients with PsA, SpA and JIA contains a population of CD25brightCD4+ T cells with a regulatory potential. These results indicate that the presence of regulatory T cells is not only a feature of an inflamed RA joint, either seropositive or seronegative, but more generally one of chronic rheumatic disease. We propose that these cells accumulate in the joints, because in parallel with the enrichment in the joint a decrease is observed in peripheral blood. In all three rheumatic diseases analyzed, the CD25brightCD4+ T cells suppressed not only proliferation but also cytokine production, indicating a potential role for regulatory T cells to influence the inflammatory processes in the joint. These features were apparent in the vast majority of the patients despite the different treatments they received, indicating that the anti-rheumatic drugs that patients receive do not affect the presence of CD25brightCD4+ T cells in the joint. The frequency of synovial CD25brightCD4+ T cells was comparable between the different diseases. Also, a relative increase of this population in the joint in comparison with the circulation was observed in all patient groups. These are interesting findings with regard to the clinical differences between the diseases. First, the HLA associations differ: spondyloarthropathies are associated with class I HLA antigens, mainly HLA-B27, whereas RA is associated mostly with HLA-DR1 and HLA-DR4 of the MHC class II alleles. Thus, the local accumulation of regulatory T cells to inflamed joints does not seem to be dependent on specific MHC molecules despite the fact that the generation of regulatory T cells in the thymus seems to be antigen specific . Indeed, it has been demonstrated that the effector function, suppression, is not antigen specific in the periphery . Second, subdividing patients for the presence of RF or erosions does not reveal any differences between the groups with regard to frequency of CD25brightCD4+ T cells. Our data therefore indicate that the enrichment of regulatory T cells in the joints is not correlated with disease severity. Third, the different diseases analyzed here display differences with regard to the cellular assembly at the site of inflammation. Both immunohistochemical and flow cytometric analyses of T cells have shown a dominance of CD4+ T cells in RA, whereas CD8+ T cells are more frequent in inflamed joints of patients with PsA . Despite these differences, the frequency of CD25brightCD4+ T cells is similar in the inflamed joints analyzed in this study. However, regulatory T cells have the potential to suppress both CD4-driven and CD8-driven immune responses  as well as innate immunity , so this is perhaps not surprising. In summary, no significant differences with regard to the frequencies of CD25brightCD4+ T cells were found between the different rheumatic patients analyzed. In this study, all patients had chronic disease; however, each joint was not necessarily continuously inflamed. The synovial fluid samples were, however, always taken during flares, which are the time points at which they can be obtained. In our longitudinal samples from patients with PsA, SpA and JIA, the frequency of CD25brightCD4+ T cells was found to be relatively stable over time. This parallels our recent observations in RA patients . This observation indicates that individual factors, as yet poorly understood, determine the frequency of CD25brightCD4+ T cells that can be reached in the inflamed site. Our data support trafficking from peripheral blood to the site of inflammation, because a decreased frequency of peripheral blood CD25brightCD4+ T cells was observed in the patients in comparison with healthy controls. Again, this was true for the three groups of rheumatic diseases investigated so far, confirming the trend seen in our previous study with a limited number of RA patients . This finding suggests that the regulatory T cells home to inflammatory sites. Such a model is in line with the similar findings in rodents, in which a selective recruitment of CD25+CD4+ T cells to the skin of mice infected with Leishmania major was demonstrated . Even though cell trafficking has not been addressed in our present study, it is tempting to speculate that the accumulation of CD25brightCD4+ T cells to the inflamed knee joints is due to selective recruitment. However, we cannot formally exclude the possibility that CD25brightCD4+ T cells with a regulatory function can also expand locally. Nevertheless, at least in patients with JIA it has been reported that T cells in synovial fluid are not in active cell cycle . This study is the first to demonstrate that CD25brightCD4+ T cells from patients with spondyloarthropathies, PsA and SpA, and JIA have a suppressive capacity on proliferation. We also showed that these cells can suppress cytokine production, which has not previously been reported for patients with rheumatic diseases. All cytokines that were produced by the responder T cells were suppressed by the regulators, irrespective of whether they were type 1 or type 2 derived cytokines. The suppression of cytokine production parallels the suppression of proliferation. This is in agreement with several other studies [12, 29, 30]. However, the suppressive function in vitro might not be as efficient in vivo in the inflamed joints of the patients, where the inflammation is perpetuated despite the enrichment of regulatory T cells. In rheumatic diseases the innate immune system has clearly been shown to have a major role, but the regulatory T cells might not efficiently suppress TNF production by macrophages. However, this would be in contrast to the data by Maloy and colleagues , who demonstrated that the immune suppressive properties of murine CD25+CD4+ T cells are not limited to T cells' responses but also include inhibition of immune pathology mediated by cells from the innate immune system. Another possible explanation for the lack of efficiency of regulatory T cells in the inflamed joint could be the presence of IL-6. It was recently shown that IL-6 produced by innate immune cells abrogated the suppression of CD25+CD4+ T cells . This cytokine is well represented in the inflamed joint, thus providing a possible way for the immune cells of the joint to avoid being regulated. In addition, low levels of IL-2 in the joint could influence the function of the regulatory T cells . Further studies are therefore needed to understand why the regulatory T cells do not efficiently halt the chronic inflammation in the rheumatic joint. It has been demonstrated that a dissociation between suppression in vitro and in vivo can indeed occur . The efficiency of suppression varied between patients. The reason for this remains speculative until CD25+CD4+ regulatory T cells can be uniquely identified, but it is likely that different degrees of 'contaminating' activated T cells also expressing CD25 account for at least some of the observed variability. This is a major difference from animal experiments, which are performed in naive animals with only a few activated T cells. In humans, owing to a large exposure of antigens, a large pool of activated memory cells is always present. Here we partly circumvent this problem by using CD25bright cells. The sorting gates include only CD4+ T cells expressing more CD25 than the activated CD8+ T cells; in this way the contamination of activated non-regulatory CD25+ T cells is reduced. In addition, the patients were receiving different combinations of treatments, but our previous study on RA patients also showed a high variability in the degree of suppression, despite their receiving the same treatments. Our data demonstrating an enrichment of CD25brightCD4+ T cells in the joint of patients with rheumatic disorders suggest that the immune system is actively attempting to control the inflammatory responses by recruiting regulatory T cells. However, because of the complex cytokine environment, possibly leading to inactive regulatory T cells in the local environment, the inflammation is not naturally resolved. We thank Annika van Vollenhoven and Birgitta Wester for excellent cell sorting, Ola Börjesson for clinical characterization of the patients, and all the patients and personnel at the Rheumatology Clinic for providing samples. This study was supported financially by the Alex and Eva Wallström, Börje Dahlin, Tore Nilsson, Magn. Bergvall, Nanna Svartz' and Åke Wiberg Foundations, the Swedish Association against Rheumatism, the Swedish Medical Association, the King Gustaf the V:s 80 year Foundation, and the Swedish Research Council.